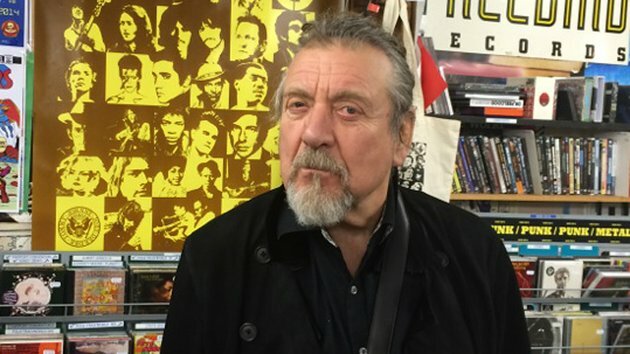 Legendary rock vocalist Robert Plant has been busy shopping in iconic Dublin record store Freebird. The former Led Zeppelin front man was in the capital to play a gig last night (Nov 24) at the Olympia Theatre, and spent almost as long in the Wicklow Street shop as he did on-stage. Yesterday he spent an hour in the shop and also returned for a second, post-gig visit. And, yep, we know what he bought. His purchases were all on CD and ranged from Blues’ icon Bobby Bland, the McGarrigle Sisters, Minnesota band Low, as well as various rock ‘n’ roll compilations and some Ray Charles. Plant also bought recordings by English singer and guitarist Terry Reid, the man who famously turned down an offer from Jimmy Page to join a band that was to become Led Zeppelin. Reid had already committed to go on the road with Cream and suggested to Page that he consider a young Birmingham-based singer. His name? Robert Plant. Brian Foley, who’s been running Freebird since it was set up in 1978 considered Plant’s visit “just another day at Freebird”, noting that previous visitors include such musical luminaries as Bob Dylan and Hüsker Dü’s Grant Hart.